Martin Winkler, Segment Manager, Textile Printing, Durst Group, says that they continuously invest in new technologies and look for ways to improve service to customers. Durst is the world’s leading provider of digital inkjet printing systems for industrial applications. In the last ten years, Durst has played a significant role in the adaptation of digital print technologies for manufacturers of large format print, ceramics, labels, glass, soft signage and textiles. Our printing systems and our environmental-friendly water-based ink technology have the potential to influence the existing market situation and to allow our customers to benefit from new market opportunities. We continuously invest in new technologies and look for ways to improve our service to customers. As part of that, we decided three years ago to focus on Pakistan. Another aspect of that is our continuous development of the Alpha Series new generation of super high-performance multi-pass printers with the One-Step Pigment Ink Greentex P.
The Durst Alpha Series features different configurations and print widths for industrial printing of fashion garment and apparel, home textiles and upholstery. 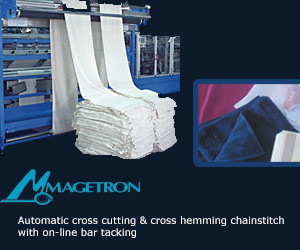 This efficient and economic digital textile production has step-less quality up to 1450 square meters an hour. Household and decor products such as duvets,linen, table cloths, curtains and drapes, as well as advertising materials, can be printed in full width up to 330cm. Durst developed the new One-Step Pigment Ink (Alpha Ink P) especially for the Alpha Series. The environmental- friendly pigment and the reactive and dispersion inks are based on the Durst water technology. Standard materials such as cotton and polyester do not require pre- and post-treatment with this ink, so the entire digital production process is accelerated and simplified. Alpha Ink R / Alpha Ink P are GOTS (Global Organic Textile Standard) 5.0-certified — All ink systems are OEKO-TEX Standard 100 compliant. management speeds up the whole production process and makes the production more economical, eliminating the long sampling stages to achieve the colour matching. Another expectation is the flexibility of printing on different textile substrates to produce a wide variety of fabrics with the same ink system and to bring a kind of ‘universalization’ in pre- and post-processes. In five years, the gap between first movers, the digital pioneers, and other companies, the followers, will no longer be so big and everyone will have found their own niche. From a service perspective, we are also actively providing our customers with more support tools. As an example, our augmented reality service tool in field-testing provides an easy and efficient way to support regional service technicians, as well as customer technicians where necessary, with the expertise of a service specialist. Through visualization in connection with AR functions, potential language barriers become a thing of the past. Another development is our dedicated Textile Application Center at our headquarters in Brixen, Northern Italy. It is becoming increasingly important because this is where customers can test their digital textile printers and optimize their printing processes. We visualize big success, the main opportunities being in Pakistan, UE, USA, India and Bangladesh. Digital textile printing supports fast turnaround short runs and sustainability while enabling savings in coloring agents and water consumption. At the same time, the Durst inkjet technology reduces production costs and times, the amount of energy required and the burden on the environment. Durst water-based inkjet technologies are an economical and ecological evolutionary step and offer greater added value in comparison to traditional production methods and to many existing printing systems. In all market segments, our main aim is to replace old technologies with new and disruptive systems. It is not just about switching from analogue to digital. It is a redefinition of the production processes. Durst series Alpha190 and Alpha330 are continually evolving with improvements to speed, productivity and efficiency to meet the needs of an ever-changing market place. Customers can print high quality, complex designs, in bi-directional print mode at much higher speed than the others, with no banding. This supports profitability via a larger production output and eliminates waste. © 2014 Copyright Textech Communique. All Rights reserved.